Cut an apple in half, spoon out seeds and cut off any stem. Place apple face down on cutting board between two chopsticks. With a sharp knife, slice down from the top until the knife makes contact with the chopsticks, this is to prevent you from slicing all the way through the apple. Repeat the process creating thin slices along the whole apple. Place apple on a baking tray and drizzle with olive oil, making sure it gets in between the apple slices. Use your Coombs Family Farms Maple Stream to spray maple syrup onto your apple as well, getting in between the slices. Sprinkle the tops of the apples with sea salt. 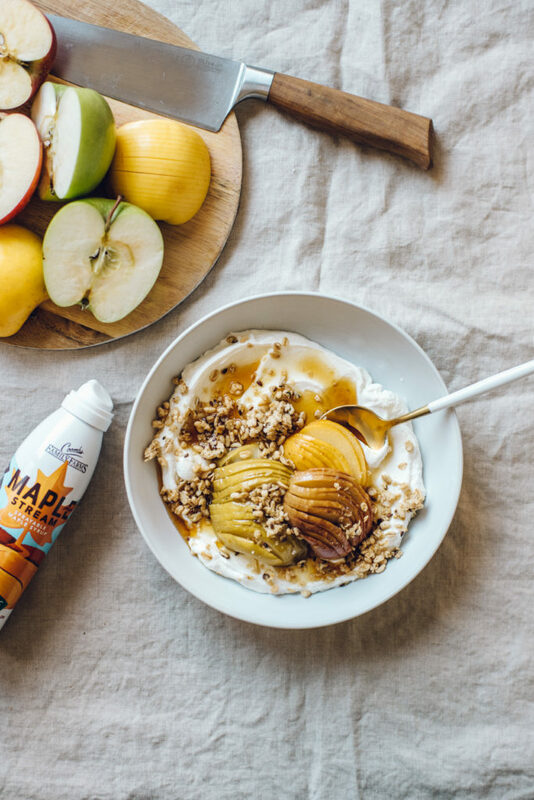 Once the apple is baked, add yogurt, apple, and granola to a bowl and spray with Coombs Maple Stream if desired.